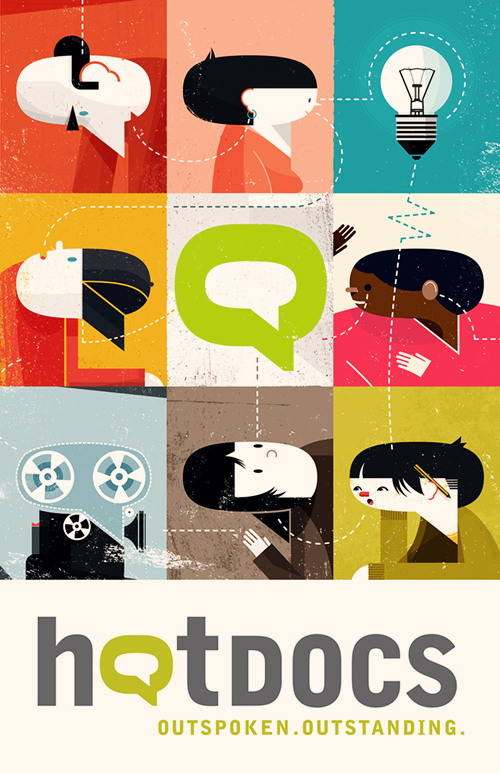 At the age of 21, Hot Docs has passed from a lusty adolescence into full-blown maturity in the most appealing way. Instead of transforming into a bland corporate adult, this appealing young beast of a festival is more community minded than ever. The opening party at the ROM in support of “docs in schools”—a programme that has screened documentaries to nearly 80,000 students—is announced right smack in the catalogue. So much for secrecy—or lavish parties held away from the public’s view. Over the ten days of the festival, there will be an interactive installation called Avatar Secrets available for the public to enjoy for free at TIFF Bell Lightbox, on stage interviews with Alice Cooper, Bib Bird (ok—Carroll Spinney, who plays the character) and Star Trek’s legendary Mr. Sulu—George Takei. Plus a live doc, with NY musicians The Quavers accompanied by filmmaker Sam Greene as the narrator, recounting and sonically enhancing true tales from the Guinness Book of World Records. Every year in my overview piece on Hot Docs, I feel compelled to point out the grim paradox that is at the centre of the full-length POV documentary. As the box office figures for Hot Docs demonstrates each year, tens of thousands of Torontonians embrace long-form non-fiction films. Yet it’s harder and harder to fund them because broadcasters ranging from the always-under-attack CBC to the “definitely for profit” channels owned by Rogers, Bell Media and other conglomerates feel that they can make more money producing cop shows and reality TV programmes than the next crop of “hot docs.” And the CRTC, to its shame, won’t make them do it. What’s important to consider in this ongoing real-life drama that is affecting the culture of our country is that Hot Docs is taking extraordinary actions to address the issue. Thanks to money received from Shaw Media (partially in response to the CRTC) and the private investment company The Blue Ice Group, Hot Docs has been able to administer $3.1 million in completion and production funds over the past six years to 144 Canadian and international doc projects. That’s a healthy and practical reply to what is still a dilemma without a resolution—yet. Now, on to the films. Canada’s roots in filmmaking rest squarely in the documentary genre, where the two traditional producers have been the CBC and the NFB. It’s nice to see the presence of two filmmakers trained at the CBC—and, in particular “The Fifth Estate” in its heyday—in the limelight at this increasingly international festival. John Zaritsky, this year’s Canadian “focus” filmmaker, has won an Oscar, seven Geminis and a slew of other awards. The veteran storyteller is often associated with grim subjects but he showed an unexpected flair for humour in Leave Them Laughing, a moving portrait of comedian Carla Zilbersmith’s last year as she slowly succumbed to ALS (Lou Gehrig’s disease). Zilbersmith is a funny, heroic subject; even old vaudeville-style jokes about death and sexuality acquire poignancy in this context. The quartet of films in Zaritsky’s retrospective are great character studies by a man who worked mainly with institutions—PBS, CBC and the NFB—but rightly thinks of himself as an outsider, documenting extraordinary lives and events. John Kastner is a funny, compassionate filmmaker who spent years at the CBC winning International Emmys for hard-hitting docs about breast cancer (Four Women), life and love in prison (The Lifer and the Lady) and kids suffering from leukemia (Fighting Back). Kastner preceded Zaritsky as a Hot Docs “focus” director and he’s returning to the festival this year with one of the strongest films he’s ever made. Out of Mind, Out of Sight is a well-constructed, deeply humanist look at four patients in the Brockville Mental Centre. Each has a tragic story but the one who tops them is a young man named Michael Stewart, who in the throes of paranoia and a type of dementia killed a beloved family member. Through the eyes of Kastner, we see Michael grow to accept his pain and those of his family. It is a tale of redemption by a filmmaker whose main influence is, appropriately, Dostoevksy’s Crime and Punishment. Another tough tale, this time dealing with the American judicial system, is Whitey: The United States of America vs. James J. Bulger. It’s the new film by Joe Berlinger, who co-directed the Paradise Lost trilogy of films about the West Memphis Three, a trio of heavy-metal punk teens who were tried and imprisoned for the murder of three young boys in a sleepy Southern town. An international cause celebre, the case was clearly flawed; nonetheless, it took nearly twenty years for the “Three” to be freed. With Whitey, Berlinger examines another example of bizarre U.S. jurisprudence. “Whitey” Bulger was the toughest hood in the notorious South Boston district for decades. Finally captured after years on the run, “Whitey” puts up a huge fight against being portrayed as an FBI informant. He seems less concerned about being implicated in multiple murder charges. Berlinger makes it clear that ratting out fellow mobsters to the Feds is far worse to a guy like Whitey than killing people, even comparatively innocent ones. The film offers a barrage of evidence from all sides including bereaved family members of Whitey’s victims. But was he a rat? Everything in this film is in flux, including sworn testimonies. Berlinger offers up a complex case and a vivid portrait of the tough Irish-American neighbourhood that is the home of Boston’s Southies. What better country to offer a response to the US legal system than Russia? The Condemned goes beyond Dostoevsky into the territory of Solzhenitsyn: the setting is a prison camp in the bleakest of winters in Siberia. UK director Nick Read got access to film in an institution filled with the most hardened of criminals, many having been condemned to death before a new law made them lifetime prisoners. The cells are tiny for these huge prisoners, who are allowed out a meager hour or two a day. Others have it slightly better. They’re allowed to mingle more freely and spend fairly considerable time in common areas. The interviews—often voiced-over in scenes of prison life—tell the stories of the prisoners. All are murderers; some did it in a drunken rage while others were in organized crime and killed people as part of their job. But then, just when you feel that you’re simply in a special circle of Dante’s Inferno, the tales become more human. Lifetime prisoners have their wives and children come to visit them. Clearly not all have been abandoned and in the expressions of love between a father and son, who has grown up without him, or a wife still devoted to a man who has been in jail for decades, one sees the resiliency of the human spirit. Perhaps only a lover of the documentary form—and a lover of Russian literature—might say this but it’s true: The Condemned is an affirmation of humanity’s impulses good and bad—and the right to life in even the most difficult of circumstances. More obviously life affirming is Pipeline, the latest film from Russian master director Vitaly Mansky. Basing his film on a pipeline that connects natural gas from Siberia to parts of Western Europe, Mansky has crafted an episodic film, replete with the joys and customs of people in Russia and elsewhere. Gradually, we move from a lovely wedding scene, where a couple move in a wild embrace from Asia (Siberia) to Europe (Russia) in a beautiful national park to a statue in a square slowly becoming animated by a band during an official ceremony, to a story of an aged Russian labourer in the West calling his grandchildren after a massive celebration in the town where he’s working. Lovingly put together by Mansky, who is an elegant film stylist, this is an essay film that quietly suggests that much binds humanity together, not just oil and gas.